“Autumn Morning” acrylic on paper board, a tiny 4 x 2.25 inches small. I love the way deep autumn reveals the rich colours and textures of landscape, the last “hurrah!” of the season. 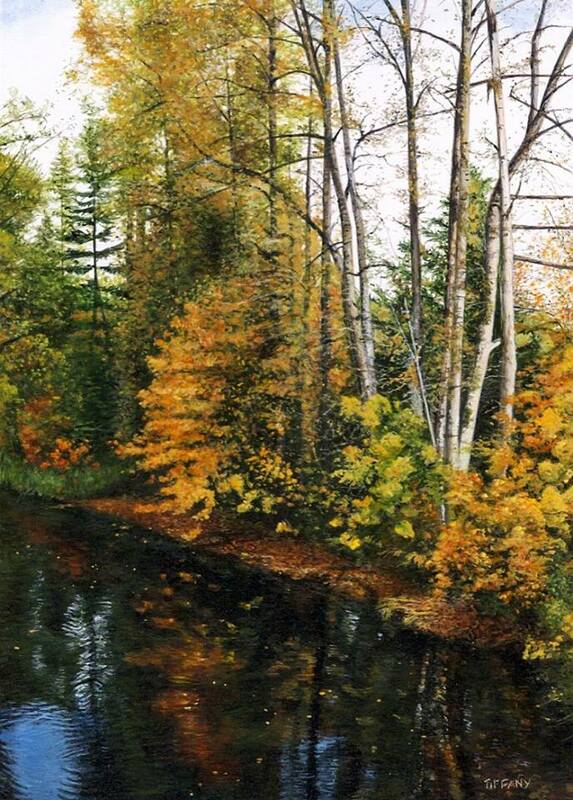 This miniature painting was inspired by a lovely October stroll with my daughter, along the Nanaimo River. “Nature’s Palette” – acrylic on paper board, a tiny 2.5 x 3.5 inches small. This painting is available for purchase at Rendezvous Art Gallery, in Vancouver, BC. The colourful leaves and crisp morning air signal a change of palette as my creative thoughts turn to the beauty of autumn. Painting this image reminded me of many walks through this lovely forest, where thoughts and memories were carried along the tracks. There is something peaceful about watching lines disappear in the distance, maybe it is the promise of possibilities. The Red Canoe – acrylic on paper board. Actual size: a tiny 1.75 x 5.25 inches small. A new miniature painting, fresh off my drawing table, “The Red Canoe” features a coastal scene along Gabriola Island, near Nanaimo BC. I felt particularly Canadian while painting this little piece and it reminded me of how lovely it is to paddle about in a canoe or row boat, or kayak for that matter! Here is a new miniature painting fresh off the table: Island Shores (measuring a tiny 1.75 x 5.25 inches small). This scene is of the east coast of Gabriola Island, a truly wonderful place to visit and walk around. The many layers of beach debris, driftwood and stone make for a pleasant afternoon of beach-combing. A tiny, two inch, miniature painting comes together. This little painting was fun to do. 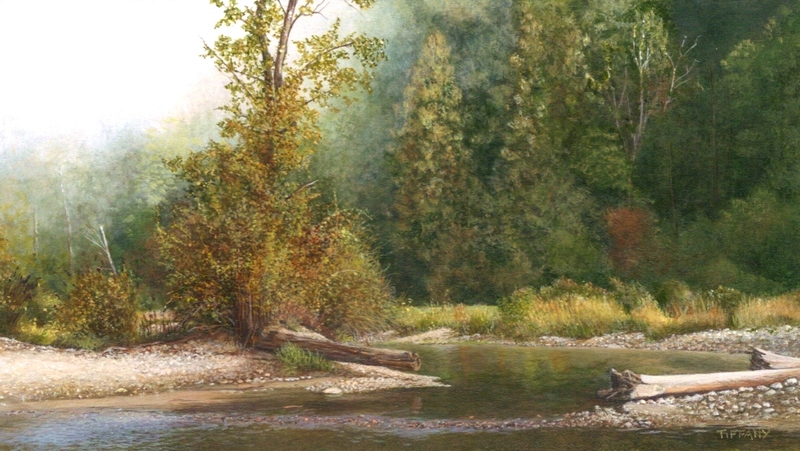 “Afternoon At The River” is a tiny, 2.5 x 2 inch miniature painting of a favourite place to visit in Pitt Meadows, BC. I’ve included a series of images illustrating how the painting came together. The image is painted in acrylic, on a paperboard surface.